Want to check out multiple restaurants in Denver without having to buy a full meal at each one? Well then Dishcrawl is for you! In the simplest of descriptions, Dishcrawl is a barcrawl with food instead of adult beverages. Dishcrawl started in San Francisco, and their slogan is simple: Eat Food. Meet People. They’ve grown to include over 100 cities in the US and Canada, and they host guided tours through city neighborhoods allowing people to discover new restaurants and make new friends. After buying a ticket to the event (normally around $45), participants are taken to 4 different restaurants in a particular neighborhood where they can sample food prepared by each restaurant. All of the stops on the Dischcrawl are within a 10 minute walk of each other at most, and give you a great opportunity to digest and interact with other participants on the walk to the next restaurant. We were invited by Dischcrawl Denver Ambassador Julie to take part in the Dishcrawl through the Highlands neighborhood. All of the stops were conveniently located on 32nd St. in the Highlands, and gave us a great taste (OK, pun intended) or what you can find in the hip neighborhood. The first stop on our culinary adventure took us the corner of 32nd and Meade St. There you will find a 100 year old home that has been converted into a vibrant home-like feeling, wine/coffee/cafe house known as Highland Cork and Coffee. This was a great start to the Dishcrawl, as it reminded me of a cocktail reception at a friends house. 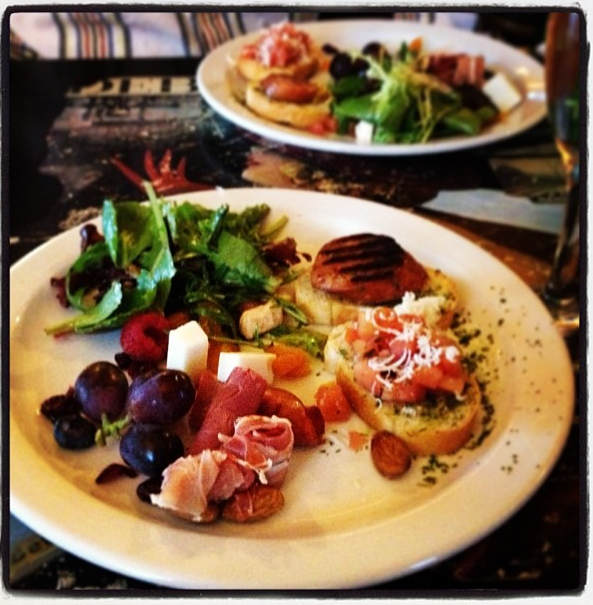 Coffee house by day and wine bar with tapas by night, Highland Cork and Coffee is about as cute as it gets. They served a light and refreshing appetizer platter, complete with a mini salad, bruchetta, spanish sausage, cured meats, cheese, nuts, and fruit. It’s the perfect place to grab a glass of wine paired with artisan food in the Highlands. A short walk down 32nd led us to our next stop, Fire On The Mountain. A somewhat recent addition to the Highlands, this restaurant and bar from Portland, OR has now become a local fixture serving craft beer and ridiculously good wings. 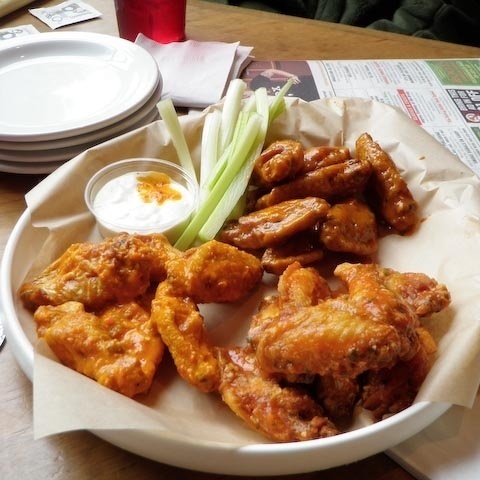 Now, we understand that eating wings that have been passed around in a frisbee to a big group of people isn’t necessarily ideal for enhancing your social situation, but the taste of the wings and sauces easily take over any self-conscious feelings about eating wings in front of potential new friends. The sauces are out of control good (we tasted spicy peanut and Jamaican jerk), and go nicely with the hormone-free, antibiotic free, cage-free Redbird Farms chicken wings. We also sampled stuffed mushrooms, tater tots, and sweet potato tots, but forgive us if all we can remember about the experience was the Jamaican jerk sauce that has been on our minds ever since. Our next stop took us a little further west down 32nd St. to the local favorite, Highland Pacific Seafood & Oyster House. Known for their plentiful oyster selection, the friendly staff and chefs indulged us with a buffet of steamed mussels, garlic herbed frites, and hush puppies, complete with a creole remoulade and a tartar dipping sauce. It’s been a long time since we’ve had moules frites, so the selection on hand at Highland Pacific did more than just hit the proverbial spot. It was a taste of both the coast and of Europe right here in Colorado. The taste and smells reminded us of a fancy San Francisco restaurant, as the funky local art on the walls brought us back to the Highlands. 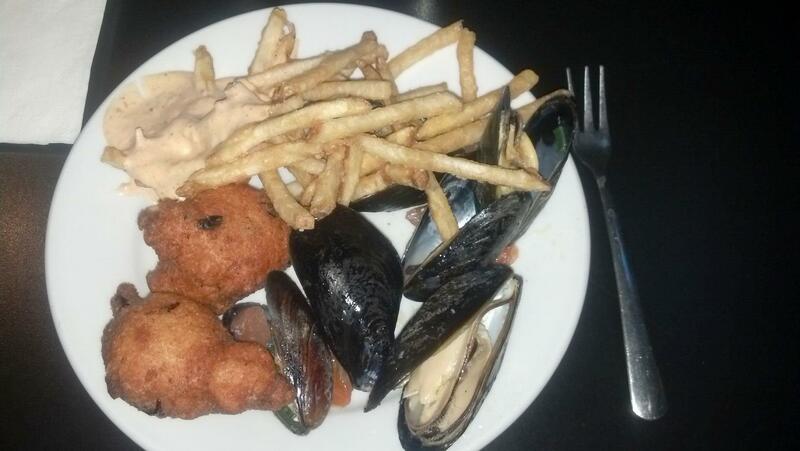 And who ever thought of serving hush puppies with seafood? Whoever it was, thank you kind sir. They do them well here at Highland Pacific. Last but certainly not least, our culinary Dishcrawl took us back east on 32nd St., past our three previous stops and to Julia Blackbird’s New Mexican Cafe for dessert. 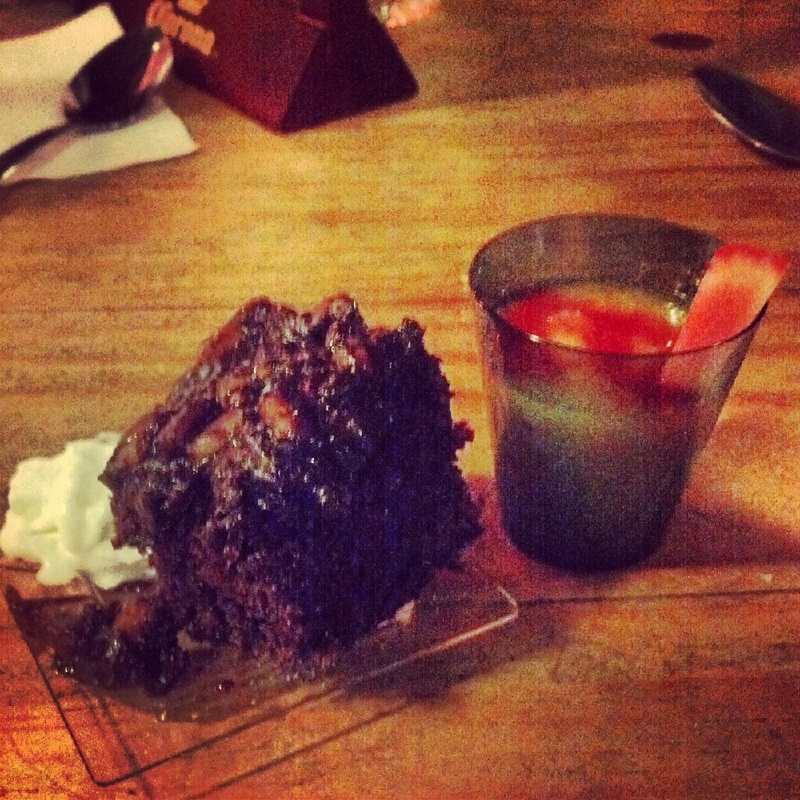 Owner and chef Julia created two different desserts for the Dishcrawl group: a Pastel de Chocolate Diablo (Oaxacan chocolate density cake topped with pinon nuts) as well as a shot of peach and Moscato “soup” with fruit sourced from Dixon, New Mexico. The cold fruit soup was refreshing and better than we expected, while the chocolate diablo cake hit the sweet spot for chocolate lovers. The inside of Julia Blackbird’s was festive and vibrant, and the restaurant stayed open a bit later to serve the Dishcrawl group which meant that we were the only ones in the restaurant. This allowed people to talk and meet new group members that they hadn’t met yet on the night. Overall, Dishcrawl Denver is a great way to discover new food, new restaurants and new people. We would not only recommend it to everyone in Denver to try, but we’ll probably do another one in the near future! We had a blast and now have 4 new restaurants in the Highlands bookmarked to try again. For more information about Dishcrawl Denver and to buy tickets to their future events, head to their website. You can also follow them on Facebook and Twitter. Thank you to Julie and to all of the wonderful restaurants who took place in the Dishcrawl!